The mention of ancient, giant skeletons in my local paper stopped me cold. I knew that a number of such remains had long ago been disinterred from one or more of the 100-plus ancient conical and effigy mounds built along the shores of Delavan Lake, Wisconsin. This was before the structures were protected by law as sacred and historic treasures. 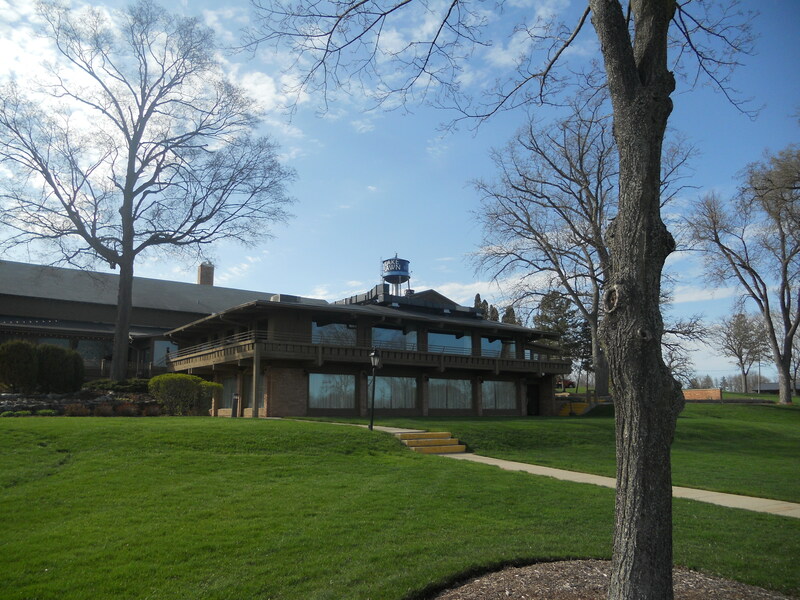 Now known as the Lake Lawn Lodge and Golf Course, the popular resort is only about a 15-minute drive from my home. I’ve been there many times and have researched the mounds and skeletons for the “Ancient Mysteries” section of Weird Wisconsin. But I’d never found any photos of the dig site, nor even a reference to such photos. None of the original, 1911 newspaper stories on the discovery had provided illustrations. If such photos existed, I was very eager to see them. Unfortunately, great numbers many of both types of these mounds were leveled by early settlers in order to clear the land for farming, houses, and even – from 1850 until almost the turn of that century on Delavan Lake – winter quarters for members of the Mabie’s Circus and Menagerie, complete with a ring barn for training horses. Jeremiah Mabie owned the lakeside part of the property, and after he died in 1867 his widow remarried. 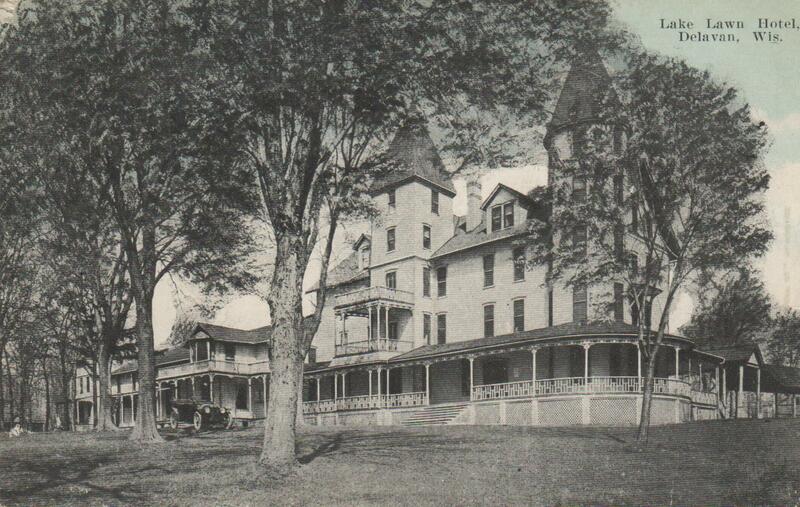 Anna Mary Mabie Phillips and her second husband, Ernest Field Phillips, built the original Lake Lawn Hotel on that beautiful shore in 1883. The grounds still contained many of the original mounds at that time, but treasure seekers had opened various of them without finding much. In early March, 1911, the couple’s two sons, Ernest and Chester Phillips, decided to see for themselves whether the conical mounds might indeed contain burials and artifacts. They chose a 40-foot-diameter mound behind the hotel’s horse barn, and soon uncovered a burial chamber six feet below the top of the three-foot high mound. The chamber measured about 7 by 9 feet, and its floor was made of carefully layered gravel, white sand and blue clay. There was evidence that the top of the chamber had been constructed of a one-foot thick layer of dirt topped with fired clay. To the excitement of the Phillips brothers, this mound did indeed contain burials: fourteen of them, including several with fractured and otherwise damaged skulls that indicated a violent death. Most of the bodies had been interred lying on their backs with their knees flexed and arms bent upwards. But two were buried in a sitting position. The only artifacts found (and these were in the top of the mound, not the chamber) were a piece of flint, an 8-inch sandstone “pebble,” and a 6-inch red stone. Ernest Phillips submitted a full report of the findings to the Wisconsin Archaeological Society on the 21st of that month. A little over a year later, in 1912, the Phillips brothers decided to dig into another, similar mound in the same area as the first. This burial contained one skeleton in a sitting posture, a female and small child lying next to it, and one other adult. The remains of a possible clamshell necklace was found beneath the female burial. According to a later recap in the December, 1926 issue of The Wisconsin Archaeologist, the skulls of these burials all had “low, flattened foreheads.” But that’s not all. So who were these super-sized people with sloping heads and jutting chins? They probably weren’t the Algonquian, Winnebago, Sac and Fox people encountered by European settlers in the late 1700s and early 1800s, who were mostly under six feet tall and lacked the exotic skull features of those buried in the two mounds. Estimates of the age of the mounds and bones ranged as far back as 2000 years, and most traditional anthropologists would align these large people with the mound-building groups dubbed the Adena and Hopewell. The Adena people had some rather unique and recognizable features, according to an article in March, 1985 FATE Magazine by Jim Miles. He quotes Carnegie Museum curator Don W. Dragoo to note that the Adena were distinguished both by body heights over six feet in height with “massiveness of the bones [that] indicates powerfully built individuals,” and by “a massive protruding chin.” Dragoo’s study was based on almost 100 skeletons found in Kentucky, Ohio, and West Virginia. Some similar individuals may have been buried just north of Milwaukee and other points around Wisconsin. Beaver Dam’s terrific Dodge County Historical Society Museum displays photos from excavations made a few miles east of town in their Nitschke Mound Park. The skeletons in these photos don’t appear unusual. 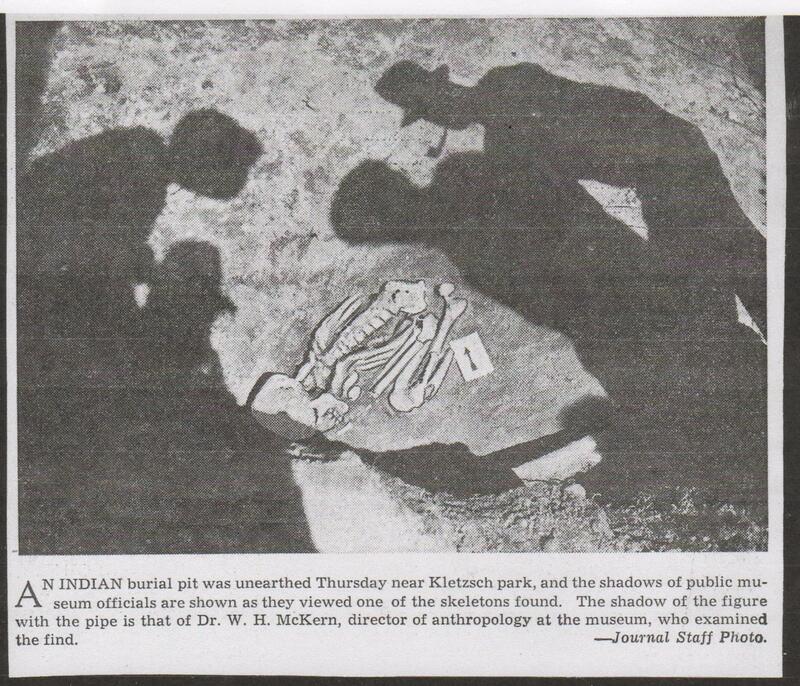 However, on a recent visit some friends and I were allowed to look through the files, where I found an old newspaper clipping of a burial dig from The Milwaukee Journal, date unknown. This one (see scan, left, of the copy the museum made for me of the newspaper clip) revealed a skeleton with a truly strange, enlarged and weirdly shaped skull that was unearthed in Kletzsch Park along the Milwaukee River, probably in the 1930s. The photo includes the silhouette of a director of anthropology at the Milwaukee Public Museum, W.H. McKern. Researchers have proposed many theories as to the origins of these large people. Author Marzulli believes that some of these skeletons may have belonged to a dispersed remnant of the people referred to in the Old Testament chapter 6 (verses 1-4) of Genesis as the Nephilim – offspring of the “Sons of god and daughters of men.” One key element Marzulli points to is that so many of these skulls feature cranial elongations and oddities that cannot be explained by normal variations of human physiology nor by skull-flattening practices some native peoples employed to reshape their infant children’s skulls. These anomalous skulls with huge and weirdly shaped craniums are widespread throughout the Americas, with a particularly large number found in Peru. Some researchers believe the skeletons are those of extraterrestrial aliens or even Bigfoot, and I have to admit that the description of those massive skulls with giant eye sockets and flattened foreheads does remind me of witness descriptions of Sasquatch. Others believe that the Sasquatch are the remnants of the Nephilim, and that the Nephilim were extraterrestrials. The traditional anthropologist’s answer, usually, is that these were simply very robust indigenous people or individuals with either naturally inherited stature or growth hormone problems. Various medical conditions that contribute to giantism do exist today. Robert Wadlow of Alton, Illinois who grew to a height of 8 feet, 11 ½ inches, needed a 10-foot casket after he died in 1940 at age 22. But photos of Wadlow show him with a very normally (according to our own Western, modern standards) shaped head. It seems these skeletons represent a true mystery. I called the Delavan Historical Society to see if by chance they had some shots of the digs in their collection, thinking that if they did, they might want to go collect the reward. Small-town historical societies can always use extra funds. They did know about the offer – Marzulli had already visited them in person – but alas, they had found nothing for him. One of the staffers gave me the name and phone number of the elderly daughter of a former owner of the property back in the mid-20th Century, however, on the chance that such photos may have been handed down within her family. The very kind lady wasn’t sure, but invited me to have a look through her father’s old family photo albums. That visit was a story in itself, but yielded no dig photos. Part of the reason for that, of course, is the completely understandable outrage that Native Americans feel at seeing burials sacred to them dug up and displayed for all to see. Almost all museums and other institutions that have harbored remains of Native Americans have by now repatriated their collections to the appropriate tribal entities. But beyond that, there seems to be an extra wall of silence regarding the existence of these huge skeletons with the unusual skulls. I do know, thanks to a 2004 interview I conducted with the late Delavan historian, Gordon Yadon, that two of the largest Delavan Lake skeletons were removed from the mound and taken to a house the Phillips brothers owned in town. The brothers, Yadon told me, coated the bones with shellac to preserve them. After both brothers died, their belongings were auctioned off but the skeletons weren’t part of the sale, said Yadon. No one knows where they went. Or if anyone does, they aren’t talking. I presume any alleged photos disappeared with the skeletons. Some later excavations were made of a turtle mound and a linear mound at the resort in November, 1955, by representatives of the Campus Archaeological Society of the University of Chicago. This dig was duly photographed and recorded, and from what I could discover revealed only the more usual contents of Woodland-era burials, including a few skeletons “bundled” in the traditional manner of many Native American cultures. It’s possible that some of the remaining mounds still hide secrets from prying, modern eyes, and if so they will remain hidden thanks to our present laws governing preservation of such sites. If it’s any comfort, I’m sure that’s what their makers intended. “Startling and Important Discovery,” The Delavan Republican, March 23, 1911, p. 1. “Scene of Old Battle,” The Delavan Enterprise, March 23, 1911, p. 1. “Strange Skeletons Found,” The New York Times, May 4, 1912. “The Legend of Lake Lawn Lodge,” 2001 Visitor Information Guide, (publisher uncertain) pp. 40-41. 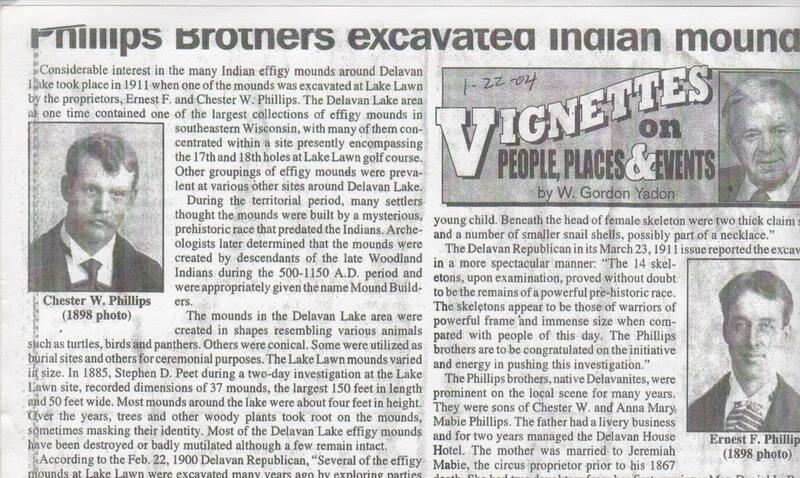 “Phillips Brothers Excavated Indian Mounds,” W. Gordon Yadon, Delavan Enterprise, Jan. 22, 2004. Jim Brandon, The Rebirth of Pan; Hidden Faces of the American Earth Spirit, Dunlap, Ill.: Firebird Press, 1983, p. 243-246. Birmingham and Eisenberg, Indian Mounds of Wisconsin, Madison, Wis.: The University Press, 2000. For extra research: Mary Sutherland, a researcher and co-owner of Burlington’s Sci-Fi Café, has written a book filled with many verbatim newspaper reports: The Red Haired Giants: Atlantis in North America.